Less than one in five Sydney residents support the merger of their Council as outlined in the State Government’s “Fit for the Future” reform package, new research has shown. The poll carried out by Micromex Research, primarily by random telephone interviews, found 82% of the community are opposed to the Mega Councils proposed by the Baird Government. Local Government NSW President Keith Rhoades AFSM said the polling clearly demonstrated the strength of community opposition to the forced amalgamation of Councils. “The State Government has failed to convince residents that forced amalgamation is a good idea,” Clr Rhoades said. “The majority of residents feel that their local Council is doing a good job and they have concerns that the proposed Mega Councils will not have capacity to address local issues. “Residents and ratepayers recognise their Councils are about far more than just rates, roads and rubbish collection – they are grassroots democracy at its most fundamental. “Local Government is the only way the majority of ordinary individuals can have a direct input into the future of their neighbourhoods and the way they live their lives – and they don’t want any sphere of Government riding roughshod over this right. “They don’t want to be forced to give way to big developers, or to see their lifestyles impacted by decisions into which they have no meaningful input. Cr Rhoades said the polling was conducted by Micromex Research and Consulting and covered 14 diverse Local Government Areas with a combined population totalling around 1 million residents. Respondents were selected by random telephone interview and asked to rate their support on a range of options for their Local Council – from the no change/stand alone option through to the amalgamation proposed in the Baird Government’s Fit for the Future program. For each option they were asked to indicate whether they were “very supportive”, “supportive”, “somewhat supportive”, “not supportive” or “not at all supportive”. Cr Rhoades said the sample size of 7,416 respondents of the research was significantly larger than that used by pollsters conducting the research used for political opinion polls published regularly in the media. “People are telling us they don’t want to be forced into Mega Councils with populations the size of Tasmania,” he said. “Why is the Government refusing to listen? Cr Rhoades said LGNSW supported Local Government reform which genuinely benefited residents and ratepayers. Voluntary amalgamations, backed by community opinion and a solid business case, are strongly supported and should proceed. But he said the Association opposed forced amalgamations of financially sustainable Councils whose residents were opposed to any merger. 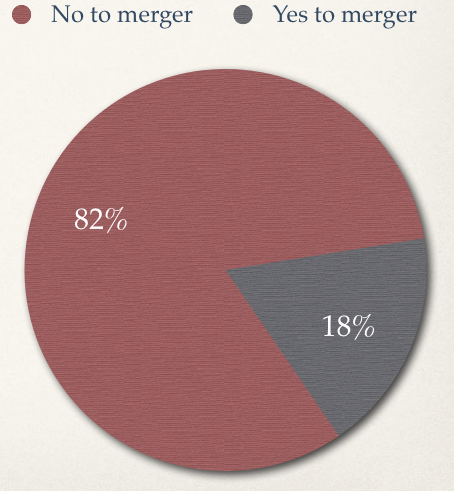 82% of Sydney metropolitan residents are against State Gov proposed mergers, according to a recent survey.